I ran this last year and while i think this is an awesome half-marathon (the run out of Central Park thru Times Square is worth the entire race), i was undecided on running it again. It was cold in 2015, the wait is long for the start and the crowds make a PR unlikely. But i did not want to run a Spring full marathon and i wanted to stay in racing shape so i entered the lottery just in case. I was regretting my luck as i stood at the start in too cold temps (worst than 2015, they were forecasting snow!) for the 2016 race. For some reason i was in Wave 8 (was in Wave 6 in 2015) so there was quite a bit of traffic. Race unfolded similar to my 2015 race, too tight crowded over the first 5 miles so running a little slower than my target, ran too fast through times square, and due to the slow start had enough to run a strong final 5 miles. Official time was just over 1:40, which is right around where i expected. From experience i think that would translate to a 1:37 in a local race, but even at 1:40 that’s nearly 10 minutes faster than last year! This race is still a pain due to the size and logistics (all well done, but size makes it difficult), the crowds and technical course make running a PR difficult, and maybe it’s my bad luck but two years in a row the weather has been too cold! But i would still recommend this as a great half to run, the route and crowds are impossible to replicate anywhere else! I had signed up for the MCM before i competed in the Paris Marathon in the spring (my first), in hindsight i may have not registered if it was after my first marathon! I modified my training a little and did high mileage but slow pace. I ended up running about 1200 miles in 5 months of training, with the first 4 months at a pretty slow 11 minute average monthly pace. In the last 6 weeks of training my training pace dropped down into the low 10s. I did my practice half-marathon at 7:55 and the Army Ten Miler (which covers a good portion of the MCM) at 7:23 so i knew i had the speed at the short distances but i had to trust i had the endurance at the long distances. The race did not setup to be easy, temperature was good in the upper 50s at the start but there was light rain for the first 90 minutes, so had to run the course with wet clothes and damp socks for most of the race. From my splits, it looks like all those miles paid off. I was able to run a pretty even split for my halfs, 1:55 and 1:58 and i kept a pretty tight range on my 5K splits. And unlike my first marathon i didn’t really ‘lose it’ at any point. I did fight through some moments (especially miles 22-24) but i only lost a few seconds per mile. 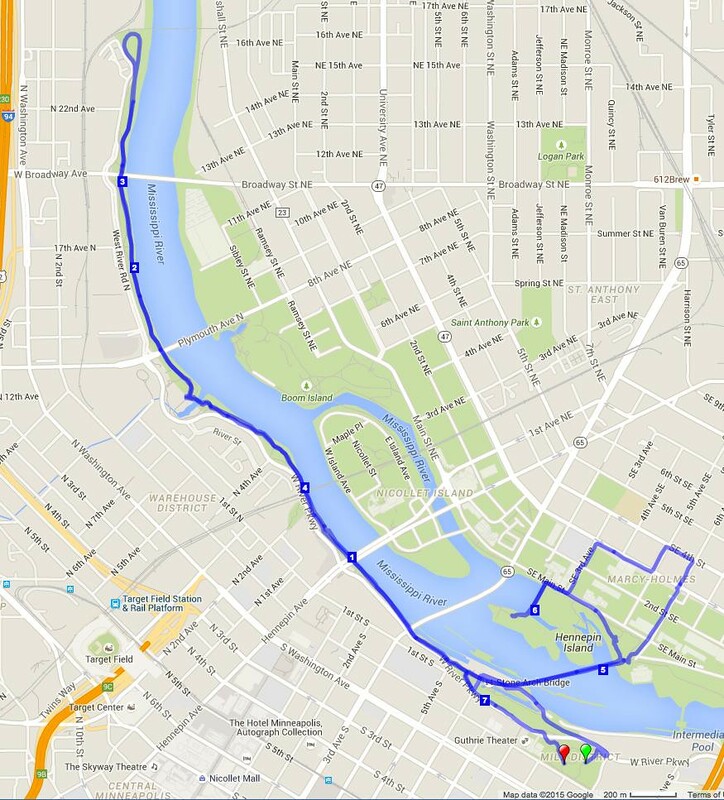 The final time is a little misleading as my GPS watch says i ran 26.83 miles with an average moving pace of 8:35. On a faster, less crowded course i may have broken 3:50. I’m a little surprised at my overall place as it puts me just over the 10th percentile for finishers (only about 23K out of 30K finished). If you’re reading this and looking for tips. 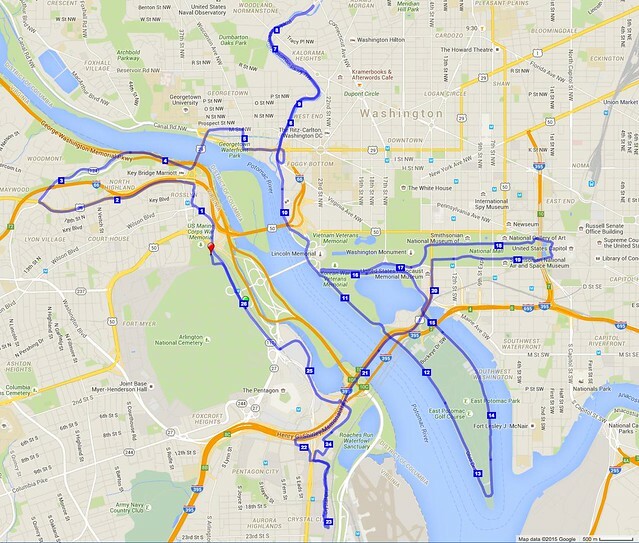 My original plan was to park in Roslyn and take metro to the Pentagon (same as for the ATM) because the bag drop-off is there and then you walk about a mile to the start. When i got off I-66 at Roslyn the road i usually take was closed but i was able to drive up Wilson Blvd and found a parking spot between Roslyn and Courthouse. I followed everyone else walking towards Roslyn and noticed that quite a few people were walking towards Arlington Cemetery. I followed and found out that you can reach the start from the Finish Line side. The security line is a little slow because you only have one entry but it was manageable. What i did not know was that if i wanted to drop off my bag i’d have to walk all the way back to the Pentagon. I’m not sure but i think some people actually dropped off their bag at the finish instead of the start. I ended up tossing my bag (just had a long-sleeve shirt for after the race), if i were to do it again i’d figure out if you can drop off the bag at the finish or just skip checking a bag. There’s plenty of food, gatorade, and water at the finish, so the only thing you’d really need to check is a change of clothes. The bag-drop snafu aside, it was a pretty good parking plan. The (slow) twenty minute walk back to my car was easy and i got home pretty quick. 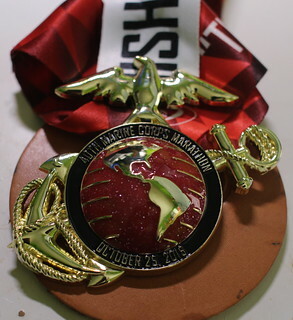 The finisher’s medal is pretty cool. A little hot so far north, but very popular with runners (both organized groups and singles), there’s a neat stone bridge that crosses the river (Stone Arch Bridge) dedicated to pedestrians and bikers. There are some neat side trails along the way. I got a little lost on the north side (at the bottom) so didn’t go quite as far as i would have liked. FYI the football stadium is being rebuilt, so there is a lot of construction going on in this area. Louisville: One Run, Two States! I’ve spent a few overnites in Louisville for work recently (very nice town, great place to visit). On the last trip i worked in a run through the waterfront and found the “Big Four Bridge” which is an old rail-road bridge that was converted into a pedestrian bridge between Kentucky and Indiana over the Ohio River. I was feeling good this day, so i did intervals back and forth over the bridge, ten miles in total. This is a very popular bridge and park with a lot of folks running and walking to either side. 2015 Marathon de Paris via Flickr http://flic.kr/p/rWkCgq ok, so cut to the chase 4:26:52 finish at a 10:06 pace for my first marathon. But that does not really reflect the difficulty of this race, have a look at the splits. 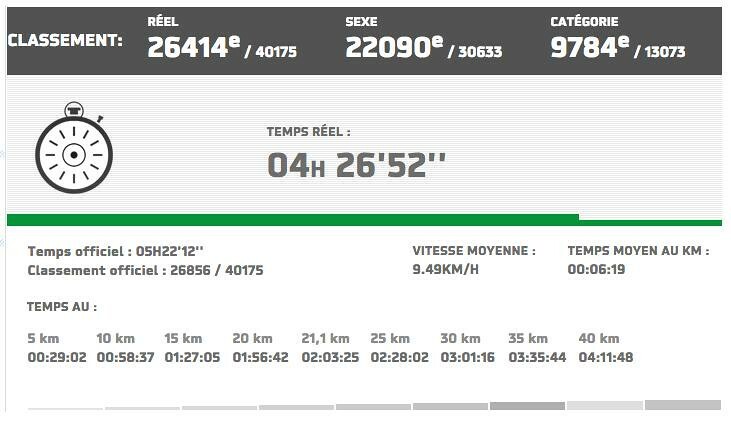 The half-marathon split was ok (21.1 in 2:03:25, though i was behind a 4 hour full race time), and up to 30KM i was still ok at 3:01, but then the last 12KM (7.5 miles) really killed me taking 1:25 to finish (~11:20 pace). It was hotter then i expected at around 65F but i just did not have the speed to finish as strong as i wanted to. 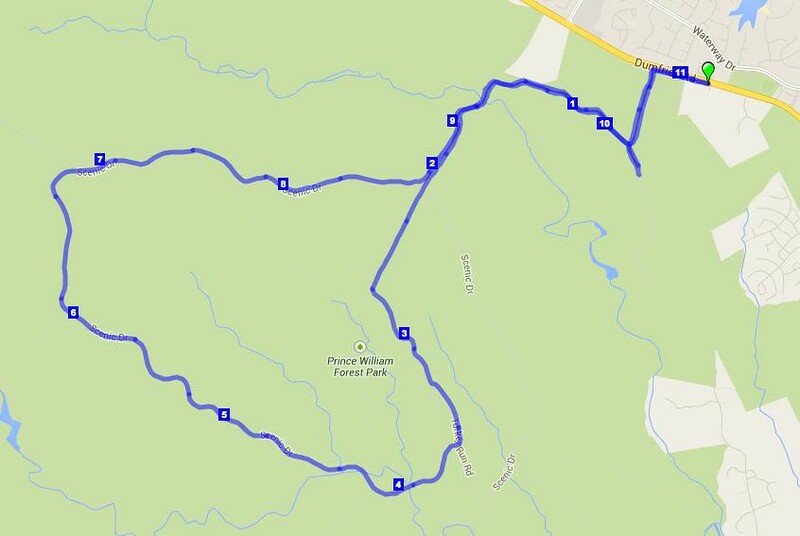 The course is pretty in the first 1/4 and the third 1/4, the middle part and last part through the big parks is a little tough as there are not a lot of spectators and isolated so it requires some trudging through those miles. The open is great as you run past Concorde, the Louvre and after making the loop at Bois de Vincenne you come up on Notre Dame and the Eiffel Tower. The organization for this race is a little different when compared to US races. Water is only every 5KM, so make sure you fight for water due to the long gap between stations, and i really mean fight as it’s a scrum to get water. They also serve fruit and sugar cubes at some stations–yes, real pieces of cut-up fruit, in this case bananas and oranges which people then throw the peels onto the wet road so you have to take care as you run through the aid stations. In some parts of the race near the end, there are no barriers on the street so people start standing in the streets and then you run through a tunnel of people which is both exciting and nerve wracking! Aside from these few odd bits, overall it’s a nice race to run and you have the bonus of enjoying Paris after your race! 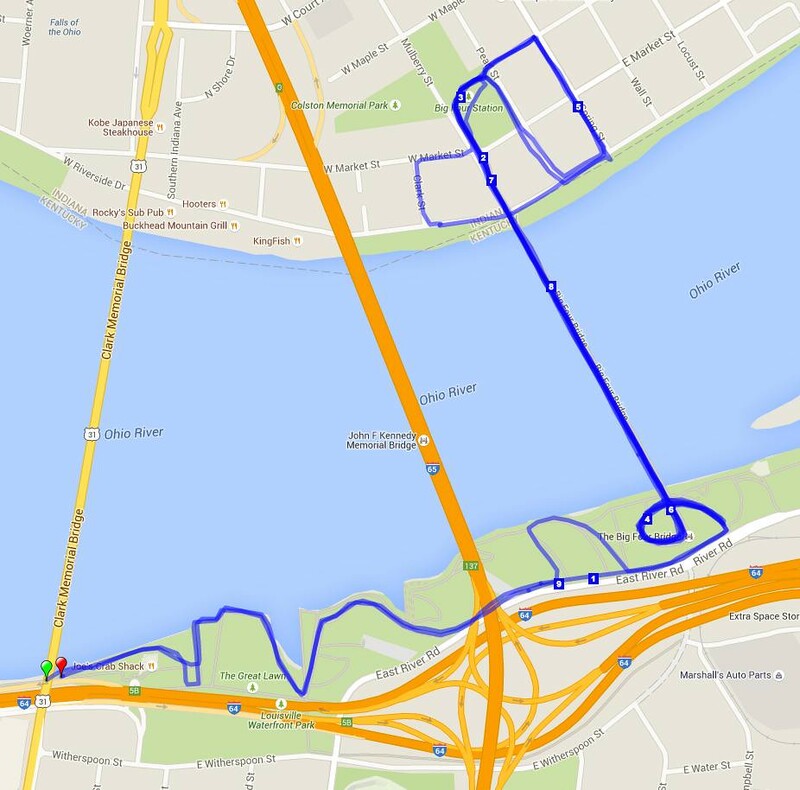 2015 NYC Halfvia Flickr http://flic.kr/p/sdRPn8Let’s get this out of the way up front, if you look at the course, yes you can run most of this course any day of the week yourself. 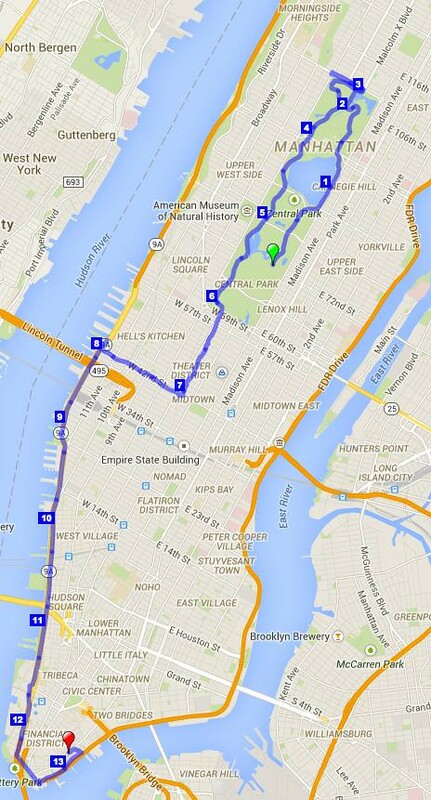 With the first 6 miles inside Central Park and the last 5 miles running along the West Side Highway, this is a route that many runners do on their own. 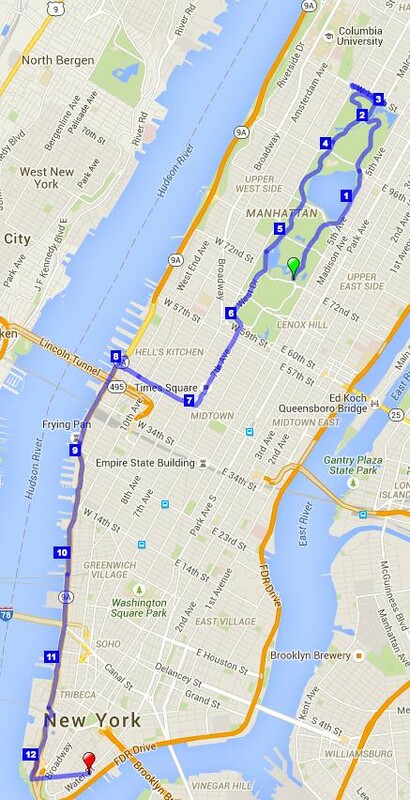 The big reason to run this race is for miles 6-8, coming out of Central Park you run down 7th Ave (yes in the middle of 7th Ave) to Times Square and then along 42nd St to the West Side Highway. This is your only opportunity to run thru Times Square and it’s a great experience to run thru that area with the streets closed and the crowds along that section. I ran this at 8:10 pace and finished around ~1:49 but i over-ran the race by about 400M so closer to ~1:46 ignoring the extra distance. Organization is typical NYRR (which is to say great), this race is pretty large around 20K runners and based on lottery so sign up for NYRR to receive the notice and put your name into the drawing in January. It is a 3 wave start, I was in the 1st wave and it wasn’t too crowded, i could see it being a little more crowded in the back later groups. Overall i think is is a great race to run, the experience of running through Times Square is unique enough that i feel it’s worth it despite the fact that you can run most of the course on your own. This is an odd race, the course is actually quite fun, running through Prince William Park down in Woodbridge (a number of races use this park over the year), but the primary reason that people run this race is that finishers get a guaranteed entry into the Marine Corps Marathon in October. The MCM is now lottery based for entries (though it’s much easier to get into then NYC), so if you miss out on the MCM lottery this is one of the few ways to get in. Unfortunately they limit the field to around 2000, registration is less then 2 weeks before the race and this year it sold out in about 5 minutes. With that said, the range of racers is very wide, from folks who have not yet started their training at all, to folks that are well experienced, so it requires a lot of attention during the race due to the range of racers. The course itself is reasonably challenging, nearly all in the woods and most of it on crushed gravel trails. There are a few tricky sections where the rocks are quite large (golf-ball size), so watch your footing-especially if the trail is wet. There are a handful of hills on the course, including a set in the last mile so keep a little in reserve. 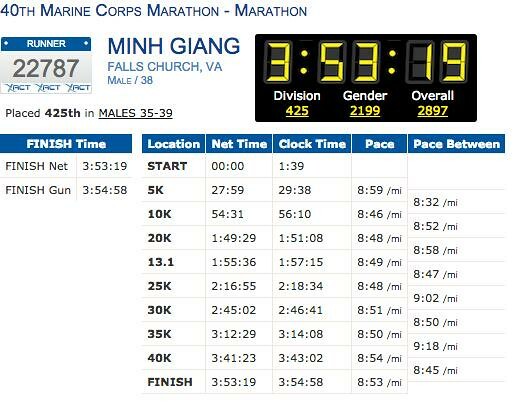 The race length, 17.75K (just over 11 miles) is for the founding year of the Marines, 1775. Overall it’s a pleasant race, but because of the different motivations it’s not a great experience race. The organization is great (though the long wait at the start due to the need for shuttle buses stinks), but the atmosphere is not as fun as other races.